You’ve probably heard of how pitchers and catchers can steal strikes via expert control and framing. Some guys are just so good at painting the edges that they get those calls, plus the benefit of the doubt on the ones that push a little further outside. Think Zack Greinke, Aaron Nola, or Kyle Hendricks for pitchers. On the catching side, the names are less heralded, but think Yasmani Grandal, Jeff Mathis, or Max Stassi. They all deliver or receive the ball with such veracity that it’s almost magical to witness as a viewer, and probably infuriating as a hitter. But all’s fair in love and baseball. If pitchers and catchers can aid themselves in stealing strikes that help them get outs, logic follows that hitters can do the same to prolong at-bats, even if we don’t necessarily talk about it under the same terms. Certain guys are just better than their peers at knowing when to swing and when not to, whether the ball is in the zone or not. And maybe, just maybe, that’s part of why the Phillies went out and acquired Andrew McCutchen and Bryce Harper this winter: they know when they can afford to not swing, even if the ball ends up on the edges or in the zone. In addition to Rhys Hoskins and Cesar Hernandez, the team now has three of last year’s top five hitters in baseball (and four of the top 30) at getting pitches in those spots to be called balls. There’s a lot to unpack here. In each of the past three seasons, only about 220 hitters have qualified to be a strike thief each year by having seen at least 1,500 pitches. While hypothetically that works out on average to about seven guys per team, it’s certainly not how the talent is actually distributed. Just seven teams accounted for half of the top 30 alone in 2018. In many respects, what one team has is what another inherently can’t. That would also mean that what one team has the most of, their competitors are left with an equal and opposite dearth. The Phillies having four of the top strike-stealing hitters of last year would be a tie for the most since the 2016 Jays that featured Josh Donaldson, Russell Martin, Michael Saunders, and Jose Bautista. The numbers for Harper and Hoskins are skewed because of playing time spent in the minors or lost to injury, but their most recent skills show legitimate ability to steal strikes. The other big names Philadelphia has acquired this winter aren’t too shabby at stealing strikes, either. J.T. Realmuto ranked in the 63rd percentile last season and Jean Segura ranked in the 54th. The collective ability of the presumptive 1-6 hitters in the team’s revamped lineup will feature two guys who can hits 30-plus home runs and four more who could break 20. This is sure to be frustrating for opposing pitchers. But imagine what will run through their heads if they give up a bomb, come back with a competitive pitch that paints the black or is even over the plate, and they don’t get a called strike. It could be like getting punched in the gut and then flicked on the nose. For the sake of the exercise, let’s keep comparing the prospective 2019 Phillies to those 2016 Jays. Toronto finished 89-73. They made it into the playoffs as a Wild Card team, won the Wild Card game, and made a run all the way to the ALCS. Their pitching staff finished with 18.6 fWAR, which was good for eighth-best in baseball, and their hitters combined for 22.8 fWAR, which was good for sixth-best. The Phillies’ pitching staff currently projects to be worth 16.1 fWAR and their hitters project to be worth 25.5 fWAR. The difference? An uncanny one-tenth of a win, before accounting for the way projections are naturally conservative. A step forward from any young Phillies pitcher, of which there are many, and it’s easy to see without squinting too hard that this team could make a run not just to the playoffs, but through them. If you’re concerned about the idea that just because the hitters Philly has now are still good at stealing strikes because they were good last year, that’s fair. When it comes to stats, it’s always critical to establish what’s predictive against what’s descriptive. The Phillies lineup could accurately be described as a strike-pilfering bunch. But when we look at hitters who steal strikes across the league, there are plenty of examples that suggest it’s a true skill, just like it is with pitchers and catchers. Each of the 19 hitters in the chart above has finished in the top 25% of strike stealers every season from 2016-2018. Only Kyle Seager has a middling wOBA in the same time, as he came in at almost the exact league average of .318. Everyone else is clearly above average, and 16 of the 19 are at least 27% better than the majority of their peers at getting on base. The ability of the best hitters to steal strikes doesn’t seem to be a byproduct of a keen eye, but an integral part of it. For some more visual — if anecdotal — evidence, let’s take a look at some heat maps to show where these potential strikes are getting called as balls in favor of certain hitters. It seems that in any given at-bat with an elite strike-stealing hitter, a pitcher could lose as much as a third of the zone. You’d nearly have to groove one to Mike Trout to make sure it’s a strike, and that’s quite possibly the worst idea anyone’s ever had. Some of these are just plain silly. There isn’t much research out there that backs the notion of lineup protection, but this kind of in-game support between teammates driven by their individual skills could help see the Phillies take a huge step forward this year. McCutchen and Hernandez have already demonstrated that they can maintain their ability to swipe strikes. Hoskins has shown a tremendous knack for it in his first full season and comes with the reputation of someone who knows how to work a count. Harper may be the biggest wild card in the bunch when it comes to this quiet aspect of the game, but he’s eminently capable. We know the division is going to be a dogfight, and the Phillies are planning on using every tactic possible. 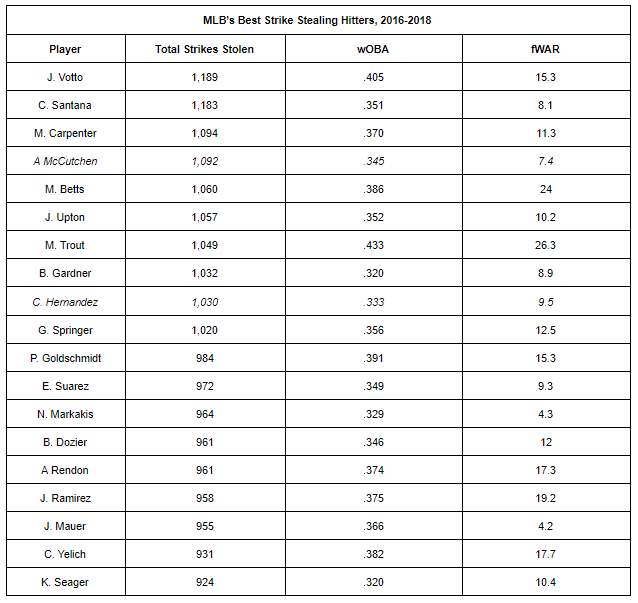 WAR and wOBA from FanGraphs. Stolen strike data and heat maps from Statcast. We hoped you liked reading The New-Look Phillies Lineup Plans on Stealing All Your Strikes by Tim Jackson! This would definitely be interesting. Currently I don’t have the ability to parse that data myself, and would need some hybrid of FG and Statcast data. Sometimes the hardest part about writing becomes the limitations presented by the tools. Or, if you or anyone knows how to work that kind of data with just Statcast queries, I’d love to talk about it. I think this works, though I might be overlooking something. This Statcast query gets you all the pitches in the “shadow” attack zone, which are basically pitches on the borderline. League-wide, when hitters take pitches in the shadow attack zone, they’re called balls and strikes evenly. You can further sort those pitches in the shadow attack zone into called balls and strikes with the “pitch result” field. Some basic Excel lookup functions should allow you to come up with a rate statistic in the form of (called balls)/(borderline pitches taken).